This post describes how to set up Single Sign-On system based on ECP profile of SAML standard. 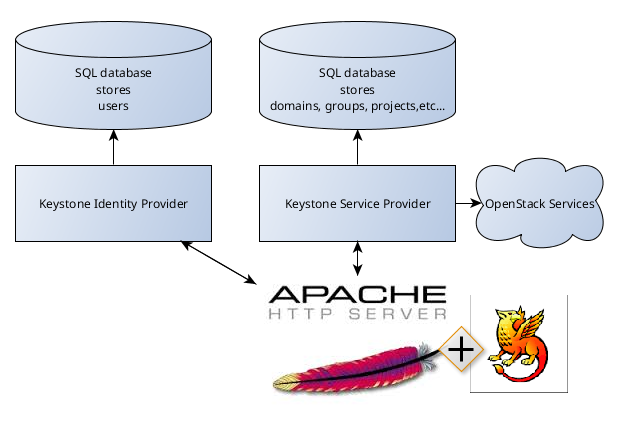 Keystone can be Identity Provider as well as Service Provider. In production environment it means that user can have one Keystone for authentication and general authorization and other as for specific authorization. Keystone supports Single Sign-On by using Keystone feature "Federation". Federated identity is a mechanism to establish trusts between Identity Providers and Service Providers (SP). Keystone is no longer the only identity service for OpenStack services, but instead, there are be a wide range of identity services distributed around the Internet, called Identity Providers (IdPs). One of the ways to implement Single Sign-On is to use SAML protocol. The SAML specification defines three roles: the Principal (typically a user), the Identity provider (IdP), and the Service provider (SP). In the use case addressed by SAML, the principal requests a service from the service provider. The service provider requests and obtains an identity assertion from the identity provider. Keystone Federated Identity provides a way to securely use existing credentials to access cloud resources such as servers, volumes, and databases, across multiple endpoints provided in multiple authorized clouds using a single set of credentials, without having to provision additional identities or log in multiple times. The credential is maintained by the user’s Identity Provider. One of SAML implementations is the Shibboleth. Shibboleth is a standards based, open source software package for web single sign-on across or within organizational boundaries. It allows sites to make informed authorization decisions for individual access of protected online resources in a privacy-preserving manner. The Shibboleth software implements widely used federated identity standards, principally the Security Assertion Markup Language (SAML), to provide a federated single sign-on and attribute exchange framework. It is possible to configure Keystone to be Service Provider or/and Identity provider. Service Provider (SP) - is a system entity that provides services to principals or other system entities, in this case, OpenStack Identity is the Service Provider. This approach to federation supports keystone as a Service Provider, consuming identity properties issued by an external Identity Provider - SAML assertions. Federated users are not mirrored in the keystone identity backend (for example, using the SQL driver). The external Identity Provider is responsible for authenticating users, and communicates the result of authentication to keystone using identity properties. Keystone maps these values to keystone user groups and assignments created in keystone. Identity Provider (IP) is a directory service, which allows users to login with a user name and password. It is a typical source of authentication tokens. New users will not be added to the Identity backend, but the Identity Service requires group-based role assignments to authorize federated users. The federation mapping function will map the user into local Identity Service groups objects, and hence to local role assignments. Thus, it is required to create the necessary Identity Service groups that correspond to the Identity Provider’s groups; additionally, these groups should be assigned roles on one or more projects or domains. Create a mapping. A mapping is a list of rules. Mapping adds a set of rules to map federation attributes to Keystone users and/or groups. An Identity Provider has exactly one mapping specified per protocol. Mapping objects can be used multiple times by different combinations of Identity Provider and Protocol. Create a protocol. A protocol contains information that dictates which Mapping rules to use for an incoming request made by an IdP. An IdP may have multiple supported protocols. To start Federated authentication an user must access the dedicated URL with Identity Provider’s and Protocol’s identifiers stored within a protected URL. Enhanced Client or Proxy (ECP) profile is available in the keystoneclient in the Identity service API. In the returned unscoped token, a list of Identity service groups the user belongs to will be included. By using the previously returned token, the user can issue requests to the list projects and domains that are accessible. A federated user may request a scoped token, by using the unscoped token. A project or domain may be specified by either ID or name. An ID is sufficient to uniquely identify a project or domain.